The annual EA Survey is a volunteer-led project of Rethink Charity that has become a benchmark for better understanding the EA community. This is the sixth article in our multi-part EA Survey 2017 Series. You can find supporting documents at the bottom of this post, including prior EA surveys, and an up-to-date list of articles in the EA Survey 2017 Series. Could you, however loosely, be described as an “Effective Altruist”? Several respondents support the underlying principles of the EA movement, but many suggested that they did not consider themselves part of the community because of their disagreement with some of the ideas, or their lack of donations to effective charities (often due to financial difficulties or perceived lack of commitment). Various respondents also seemed to view EA as a lofty, principle-based lifestyle that they had not yet attained and were therefore hesitant to label themselves “effective altruists.” A few comments suggested that the term “effective altruist” implied an underlying pretentiousness that respondents were unwilling to associate with. If there was a local group near your home, would you attend? For this question, people tended to respond in one of two ways: respondents in the first group tended to be active participants and/or leaders in their local EA group. Those that did not live in an area with a local EA group expressed interest in starting such a community. Respondents in the second group showed interest in attending occasional meetings. At the same time, these respondents also expressed some ambivalence about attending meetings. Distance and scheduling were common concerns; people also wanted to know how effective and structured the group meetings would be in reaching practical outcomes. How welcoming do you find the EA community? Responses varied widely based on the region and the particular forum being referenced. People generally commented that the online community feels off-putting to new members as the topics discussed are very specialized and members tend to be very well-informed. As a typical response went: “Sometimes the jargon and in depth conversations can be a bit alienating to someone without a philosophy or economics background.” Relating to this concern, a few respondents commented that it would be best to create a separate, more open space dedicated to bringing new members up to speed on EA ideas. Another common theme was that the EA community tends to attract members with similar ethnic, socioeconomic, and educational backgrounds. Respondents noted that the lack of diversity often made it difficult for those outside the demographic to feel comfortable in the EA community. Do insecurities about not being ‘EA enough’ sometimes prevent you from taking action or participating more in the EA community? Many respondents expressed a certain degree of guilt for not having “done enough” as an effective altruist, especially when compared to more dedicated members of the EA community. This insecurity seems to largely be the result of internal sentiments (e.g. feeling that they do not have anything worthwhile to contribute), and at least partly attributable to a dynamic inside EA groups that does not fully accommodate new members. Others expressed satisfaction with their current level of giving and the extent to which they had embraced EA ideas in their daily life. How can we improve the EA survey? In this question, respondents highlighted four critical areas of improvement for the survey content. First, they were concerned that so many of the questions asked about donations and participants’ income. According to responses, these questions were tedious and reflected poorly on the nature of EA. Second, several respondents raised serious concerns that the multiple choice questions did not account for all possible answers; for instance, one person noted that the careers list did not include a “retail” option but did have a “business” and “manual labor” option, appearing to exclude individuals of lower income classes. 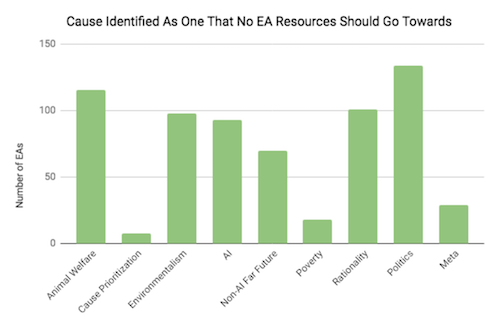 These respondents suggested that more multiple choice questions include an option for “other.” Furthermore, responses noted that many of the questions did not distinguish between EA as a set of principles for doing good and the EA community. Finally, respondents consistently noted that the survey was much longer than advertised and actually took 30-45 min. Respondents also had specific complaints about the formatting of the survey. First, several voiced frustration that the positioning and color coding of the “Exit & Clear survey” caused them to mistake it for the “next” button and accidentally delete their responses. Others noted that it would be very convenient, both for the respondents and the writers of the survey, to sync individuals’ data from the GWWC My Giving website, eliminating the need for all the questions about donations and income. The survey also caused some problems for active participants of the EA movement. For questions that gauged respondents’ interest in setting up an EAHub profile or subscribing to a newsletter, there was no option for those who had already completed these items. The vast majority of respondents heard about the survey via the Slate Star Codex blog and open threads. Respondents frequently recalled accessing the survey via Facebook group pages such as the GWWC Community page, the Effective Animal Advocacy Discussion page, local EA group pages, and the Dank EA Memes page. A significant number heard about the survey directly from EA-affiliated organizations, including 80000 Hours, Rethink Charity (formerly known as Dot Impact), Students for High-Impact Charity, and Giving What We Can; leaders of these organizations either sent out email newsletters with the survey link or directly contacted individuals with information about the survey. Post written by June Lee, with edits from Tee Barnett and analysis from Peter Hurford. The annual EA Survey is a volunteer-led project of Rethink Charity that has become a benchmark for better understanding the EA community. This is the fifth article in our multi-part EA Survey 2017 Series. You can find supporting documents at the bottom of this post, including our previous piece on community demographics, prior EA surveys, and an up-to-date list of articles in the EA Survey 2017 Series. This article brings EA demographics back by popular demand. As in, demand for the metrics not covered in the previous post. We hope you enjoy this second look. The survey respondents identified as white by a wide majority. Among the 1,069 who self-identified regarding race, 88.9% identified as white, 0.7% identified as black, 3.3% identified as hispanic, 7.0% identified as asian, and 621 respondents preferred not to answer the question. It was possible to identify with as many races as one wanted, but only 3.59% answered ‘Yes’ to self-identify as more than one race, and only one person (0.09%) identified with three races. While diversity comes in many forms, especially in a definitional sense, EA is unlikely to be characterized as racially diverse according to this survey. There may be considerable margin for error in these findings, not the least because such a large proportion of respondents did not answer. But the trope of EA being a predominantly white (89%) and male (70.1%) community, however, is not likely to fade anytime soon without directed effort. A longitudinal analysis of the community’s racial composition cannot be conducted because no data on race was gathered in the 2015 survey. Want to contribute more to this discussion? We recommend joining the Diversity & Inclusion in EA group on Facebook. A crosstab of declared racial identity according to location revealed a vast white majority across the top five EA hubs around the world. New York City emerged as the most racially diverse EA hub in the community. This was statistically significant with p = 0.02, but it’s not clear how much we can read into this. Left-leaning EAs composed 64.8% of respondents, while ‘Centre’ (8.1%), ‘Centre Right’ and ‘Right’ (3.3%) accounted for a considerably smaller portion of the sample. Libertarian EAs constitute a sizeable proportion of the sample (8.7%) a small group (6%) explicitly chose not to answer, and 9% refused to identify with any of the political spectrum. These percentages do not include the 785 people who took the survey but did not answer this question. Data on political preference was collected but not published in the 2015 EA Survey report, allowing us in 2017 to present longitudinal data on community-wide shifts in political orientation. From 2015 to 2017, the survey indicates a slight shift away from the political left in the EA community. The tables above show 27.27% of the 2015 ‘Left’ moved to the ‘Centre Left’, and 5.88% of the ‘Centre Left’ went “Centre”. There was also some polarization, as 46.15% of the “Centre” moved “Centre Left”. Want to contribute more to this discussion? We recommend joining the Effective Altruists Discuss Politics group on Facebook. When looking at the relationship between politics and other areas, we broke down political orientation into whether someone identified with the “Left” (i.e. they said they were “Left” or “Centre Left”) or did not identify with the left (i.e., they picked a different option like, “Centre”, “Centre Right”, “Right”, “Libertarian”). “Other” and “Prefer not to answer” were dropped from this variable. We found 682 respondents who were associated with a left-leaning position (left), 212 respondents who were not associated with a left-leaning position (non-left), and 943 people with no position. A crosstab of political orientation and cause area preference revealed that individuals on the left are more likely to be interested in politics (28% of people on the left rate politics as a top or “near top” cause, compared to 22% of people not on the left), poverty (78% of people on the left rate poverty as a top or “near top” cause, compared to 72% of people not on the left), animal welfare (41% of people on the left say animal welfare is top or near top compared to only 28% of the non-left), and environmentalism (42% of people on the left say environmentalism is top or “near top”. compared to 21% of non-left). Conversely, people on the left are less likely to care about AI (42% of people on the left rate AI as top or “near top” compared to 47% of people not on the left). Despite the San Francisco Bay Area being anecdotally associated with libertarians, it had the highest amount of people identifying with the left, with 82.9% of Bay Area respondents. Of the other five largest EA cities, London was 80.85% left, Oxford was 76.92% left and Boston was 73.53% left, and New York City was 63.64% left. However, despite these percentages of left appearing quite different, there was no statistically significant trend in left vs. non-left that we could pick up in our data. Results show a significant difference according to political affiliation, where 48.9% on the left identified as vegetarian or vegan, while only 29% on the non-left did. 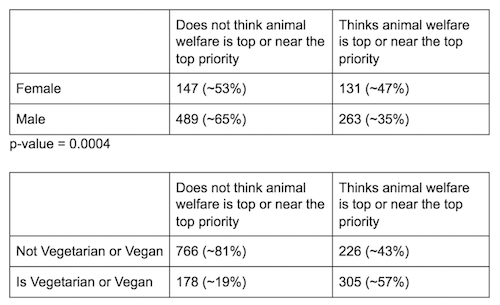 This makes sense in the light of the above, looking at politics and cause area preference, where we see a significantly greater proportion (41%) of people on the left putting a high priority on animal welfare, compared to a smaller proportion sharing that level of priority from those on the non-left (28%). Using the median age of 27 as a dividing point, those below the median grouped as ‘younger’ and those above the median as ‘older’, we compared cause area preference in these two groups. The group younger than the median age showed a preference for AI (53.1% compared to 37.9% of older people) and less of a preference for poverty (72% vs. 78% of older people). Employment status responses were lead by for-profit work (43.7%) and non-profit organizations (17.0%). There were similar numbers for self-employed (9.5%) and academics work (9.6%). Unemployed respondents made up 7.7%, while 6.8% reported working for a government entity, and 1.2% were homemakers. Those who are financially independent, through savings, passive income or a providing partner accounted for 4.6%. Respondents were allowed to select more than one field of study. Most popular fields among EA’s, by a significant margin, proved to be computer science (18.9%) and maths (16.1%). Following that, philosophy (9.9%), other sciences (9.2%), social sciences (8.6%) and economics (8.4%). Less often chosen were the fields of humanities (7.1%), engineering (6.9%), physics (6.7%) and finally medicine (2.8%). Pardoning 2017 for being the current year, the last few years appear to have been strong for EA recruitment, though there may also be a survivorship bias with EAs who joined in previous years no longer identifying with EA or take the EA survey. Post-2013, we see double-digit percentage growth in the number self-identified EAs joining the community. Some additional metrics on EA movement growth from Peter Hurford and Joey Savoie is available in “Is EA Growing? Some EA Growth Metrics for 2017”. Post written by Katie Gertsch and Tee Barnett, with edits and analysis from Peter Hurford. The annual EA Survey is a volunteer-led project of Rethink Charity that has become a benchmark for better understanding the EA community. This post is the fourth in a multi-part series intended to provide the survey results in a more digestible and engaging format. You can find key supporting documents, including prior EA surveys and an up-to-date list of articles in the EA Survey 2017 Series, at the bottom of this post. Our earlier post presented declared preferences among respondents, and donation reporting allows us to further contextualize behavioral trends within the EA community. The most recent survey of 1019 individuals collected donation data on both 2015 and 2016 donations. The survey was not distributed in 2016. This post aims to compare donation data of the EA community, and within a couple specific subpopulations. You can find donation data according to cause area and organization preference in our “Cause Area Preferences” post. Self­-described EAs in our survey reported more than $6.6M in total donations to effective charities for 2015, and more than $9.8M in 2016. Average donation amounts between 2015 and 2016 were heavily skewed upward by major donors, but the median donation amount rose $118.68. Longitudinal survey data revealed consistent year-on-year donation growth. Donors parting with $655.17 or more fall within the top 50% of EA donors. Gifts totalling $12,500 or more are among the top 10%. 405 people who identify their career plan as “Earning to give” (ETG). In 2015, these people accounted for 63.0% of total reported donations. In 2016, ETG donations constituted 57.3% of total reported donations. How Much are EAs Donating? Relatively high average donation rates seem to be commonly associated with effective altruists. So how much are EAs donating? Self­-described EAs in our survey reported more than $6.6m in total donations to effective charities for 2015, and more than $9.8m in 2016. We standardized all the donations into US dollars and found that the average 2015 donation was $6,498 among respondents, while the average donation in 2016 was $9,510. These seemingly impressive are seriously skewed upward by a few major donors. The more informative metric, the median donation, was $250 in 2015, and $655 in 2016. This increase was probably due, in part, to the fact that the survey was released in 2017, and so respondents were probably more involved with the movement in 2016 than in 2015 on average. We see evidence of this when comparing donation activity between years. The survey reveals that 150 respondents donated in 2016, but not in 2015. Only 29 donated in 2015, but not 2016. A total of 999 people provided data for both 2015 and 2016 donations. Although personal donation amounts fluctuated between 2015 and 2016, the mean donation amount per person increased by $3,663.68. This obviously includes a huge variance, however, the median donation amount also increased by $118.68. To help visualize the distribution of donation amounts, let’s look at it in terms of deciles. In other words, how much you would have to donate to be in the top X% of donors based on the reports that we have from the 2016 data. In order to top the highest donation in our registry, you would have to donate over $1,934,550. According to the survey, EA donations are highly skewed toward a handful of major donors. Many individuals could make it into the top 50% of EA donors by donating a small percentage of their income, but only a distinct minority are capable of making it into the top 1%. Donations are clearly affected by student status. In 2016, the median donation of non-­students was $1,538, compared to the median donation of students at $154. The 258 students who donated gave $252,339.60 in total, while the 482 non-students who donated gave $7,242,580.64. These donations may be over­reported, given that who donate less might be less inclined to share that information. We found, however, a relatively more forthcoming sample than expected. Among those who reported on donations, 29% in 2015 and 16.4% in 2016 reported donating $0. If you made donations not reported in the survey, please report them via the EA Donation Registry, which allows you to anonymously contribute to the public total for the EA community – you can ­also share your own donations to inspire others. The mean percentage of income donated was 7.98% of in 2016, but again this is skewed. The median is 4.28%. While this may seem low when benchmarked against the 10% commitment of the Giving What We Can pledge, it is higher than the United States national average of around 2% of GDP. To better illustrate the point, let’s look at how many people donate at or above a certain amount of income. Since many neglected to reveal their income, or made less than $10,000, this is based on a sample of 597 EAs. It is also possible that people compensate for 2016 donation deficits by donating more at different times. Note also that this finding also doesn’t capture the EAs that are saving now while waiting for better causes to donate to later. Perhaps one of the more prescient questions in the community is how much ETG individuals are donating. This question includes all individuals who plan to pursue, or are already involved in ETG careers. In 2015, donations among the 405 ETG individuals in our survey totaled $4,210,633.29. In 2016, donations totaled $5,672,334.74. The median donation amount in 2015 for 255 ETG non-students is $237.65. For 2016, the median amount is $798.57, which is actually less than the median donation for non-students generally. This suggests that many ETG individuals are aiming to give later, and perhaps building career capital in the meantime. We can break this down further by analyzing how EAs responded to “Do you believe that – for you at the moment – it is better to act now or invest to act better later?”. Among the 148 ETG non-students who answered “Act now”, the median donation was $4,510. Among the 51 non-students who answered “Act later”, the median donation was $712.08. This suggests that the low median donation for earning to give is due to people investing to give later. To look at how donation behavior changes between a subset of individuals, rather than among EA as a whole, we were able to follow a specific group of EAs who took both the 2015 and 2017 EA Surveys. The table above reflects consistent year-on-year growth in donations among 184 individuals we tracked across the last three EA surveys. It’s worth noting, however, there is survivorship bias in this group, as EAs who cease donating might also be less likely to take the 2017 EA Survey. : The median increase is smaller than the difference between the medians for each year, because it only includes people who donated in both years. : Percent income percentages were performed only for people with income greater than $10K, as donations as a percentage of income became quite absurd with low incomes, including many people donating without any income at all. This was chosen prior to any analysis. Income here refers to self-reported individual income, as opposed to household income. : The 2014 and 2015 EA surveys covered donation data of the prior year, while the 2017 EA survey covered 2015 and 2016 donation data. For everyone in the 2015 EA Survey and 2017 EA Survey who provided an email address, we hashed their email address using the MD5 hashing function and matched up email addresses between survey data while still ensuring anonymity. This variable is available as `ea_id` in all the public datasets. 180 people could be matched up between 2015 and 2017 surveys and 18 people could be matched up between all three surveys (2014, 2015, and 2017). Post written by Huw Thomas, with edits from Tee Barnett and analysis from Peter Hurford.